I'm delighted to bring you an interview with a blog baby. (A blog baby is one of my blog-followers who gets a publishing deal.) Stephanie Butland is now the proud author of a brand new debut, How I Said Bah! To Cancer. Apart from the weird way in which she found her agent, her story is a classic case of write the right book, in the right way etc etc etc. Oh, and though I would never reveal publicly that someone had been a client of Pen2Publication, Stephanie has already said that she was. And a lovely client, too. Stephanie is a delightful person and her book is great: powerful, very moving and fascinating. Stephanie Butland was diagnosed with a breast cancer in October 2008. Since then she's had surgery, chemotherapy, radiotherapy, and drug treatment, and now she's thriving. [Hooray!] She lives in rural Northumberland with her family, near the place where she grew up, close to beaches, an ice cream parlour, and most of her family. (It would be heaven if it was a little bit warmer.) Her move 'back home' after 20 years of living in London was one of the very positive side effects of her dance with cancer. Stephanie writes in her studio, which sits under the branches of an apple tree at the bottom of her garden. 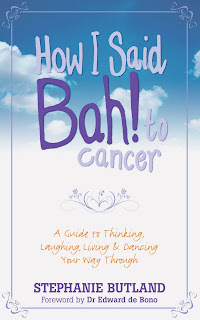 Between books and articles, she blogs and speaks about surviving cancer. Her aims are simple: to show that breast cancer is not necessarily the end of the world, and to try to make a dance with cancer easier for others by sharing the approaches and strategies that worked for her. When she's not writing, Stephanie trains thinking skills and creativity throughout Europe, and works with individuals to help them to think more effectively. In her spare time, she knits, spins, reads, bakes, goes to the theatre, takes long walks on quiet beaches, and makes excellent use of any shopping opportunity that comes her way. NM: So, Ms Butland, pitch your book to us. Who is it for and what do you hope they get from it? How I Said Bah! 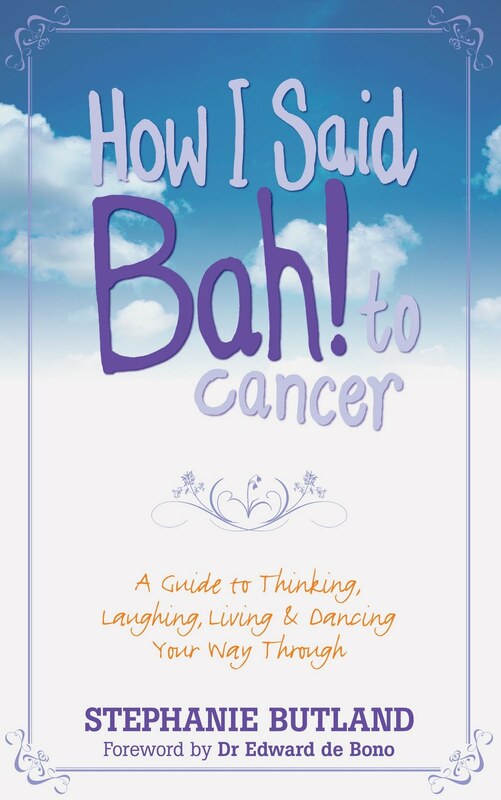 To cancer: a guide to thinking, laughing, living and dancing your way through is for anyone dancing with cancer, and anyone who wants to understand, help, and support someone who is going through it. I hope that people who read it will be comforted and helped, and I hope they will laugh a bit. It's a mix of memoir, thinking strategies, and practical advice. As well you know, because you saw an early version of it! NM: How did you get your agent? I won him in an auction! My agent, Oli Munson at Blake Friedmann, was participating in an auction to raise money for the book trade charity. Authors could bid to have their proposal and first three chapters assessed. I put in a bid, and several friends and people from Twitter chipped in too, and I won. Oli read the first three chapters, asked to see the rest, then took me on. NM: What did that process teach you about submitting a non-fiction proposal? Can you share what you learnt, in the form of tips? Anything surprise you? Getting an agent was the last stage in a long process. I wrote and rewrote until I thought my first few chapters were perfect, and then I had them assessed by you via Pen2Publication, and I realised that there was much more work to do - so I kept writing, polishing, writing, polishing. Other friends in publishing were generous with time and invaluable advice. Every single word has to earn its place in a manuscript. Getting your ms read by people who will give you honest and robust feedback is essential. The less they know you, the better. Some of the best feedback I got was after putting a shout out on Twitter for readers. You are not entitled to be published. Accept help gratefully and rejection gracefully, and keep learning. 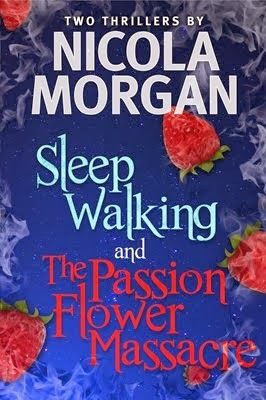 NM: Once you got your agent, what did you have to do to the book? What did you learn from your agent during this process? I didn't have to do a lot. I'd written a short epilogue, addressed to people who were dying, and Oli rightly pointed out that this wasn't really in the spirit of the book. Oli was very positive about the book, which gave me great confidence, and I pretty much left him to it - I'm a great believer in letting people use their expertise. NM: What happened then - ie how did Oli get the deal? Did your publisher make changes/suggestions? I was away from home, running a training course, when I got an email from Oli to say that Hay House wanted to have a meeting 'in advance of making an offer'. After that it all happened very quickly: we had a meeting in which people said ridiculously lovely things about me and the book, which was slightly bizarre, as when you are unpublished you somehow imagine that everyone in publishing hates books, hates writers, and especially hates you - and within a fortnight the offer had come in. NM: Did you then have to make any changes that you were a little bit sad about, even at first? Did you have to throw out any babies? If so, how do you feel about that now? Not really. I'd discussed some small changes in emphasis with my editor at Hay House, Carolyn Thorne, who was always very clear that this was my book, and I must be happy with it. Before submitting the manuscript I went through it one more time, sharpening up and expanding some bits and taking out others, and really felt that I'd done the best that I possibly could. Of course, copy-editing made it even better. NM: What do you wish I'd asked you?! Can't think of anything, I'm afraid! Questions or comments, anyone? I have a signed copy to give away to a randomly-chosen commenter in the UK. What I love about Stephanie is that she sounds so positive about life. I am sure that was one of the reasons why her agent wanted to see more than just the first three chapters. It comes across in her writing! I agree with Cat - Stephanie has such a lovely, warm & happy personality. I'd love to read her book as I'm sure it shines through. And great advice, especially the one about not being entitled to be published. Something I need to hear when the latest rejection comes through! Thanks for a truly inspiring interview. I'll be buying Stephanie's book even if I don't win! What a wonderful interview - thank you, both. And such a happy tale of success. Not being precious about your writing, and being willing to persevere are vital to success in publishing - well done, Stephanie! A great interview with a great lady full of inspiration for us all. That strength and resilience is something we should all aspire to. Here's to a brave lady! And Nicola you make my mornings! Inspirational indeed! Congratulations Stephanie and thank you for giving me reason to continue. I have today launched my website and first blog but had little confidence after reading the many pitfalls and mountain of advice over the past few weeks. Thank you also to Nicola who is a tremendous support with her invaluable advice for aspiring writers. This is a great interview - and she's embraced writing with the same courage she approached her illness. A great lesson for those of us who may be tempted, from time to time, to retreat beneath the duvet for a quick whinge. Thanks, everyone, for such kind comments. I'm blushing!